There are over 60 islands and many beaches on Indian Lake, originally known as Lewiston Reservoir. The reservoir was created by manually excavating and building three miles of earthen dam in several areas and joining seven natural lakes and large ponds. It was a Miami-Erie Canal feeder lake until 1896. 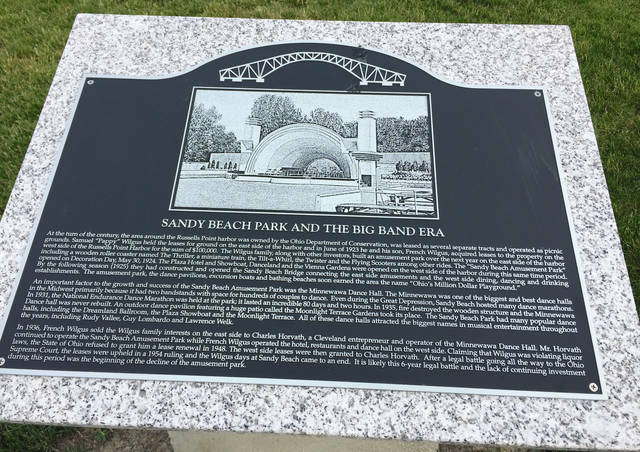 The Sandy Beach Amusement Park was known for bringing in the biggest musical stars of the Big Band Era, such as Rudy Vallee, Guy Lombardo and Lawrence Welk. The park had many dance halls including one of the largest in the Midwest, called the Minnewawa. 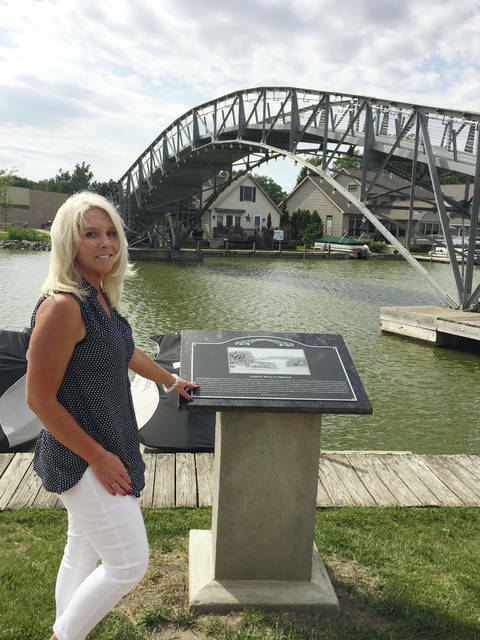 Indian Lake Area Historical Society Trustee and Sandy Beach Bridge Committee Chairperson Julie Schrader proudly displays one of the 11 new historical markers placed at the Russells Point Harbor bridge pathway. Eleven new historical markers have been installed at the Russells Point Harbor on the pathway that connects to the Sandy Beach Bridge at Indian Lake. According to the Indian Lake Area Historical Society, this area will now be known as the “History Walk.” There are six markers on one side of the bridge and another five on the other side once you cross over the bridge. These markers are fantastic and capture and preserve the rich history of Indian Lake, linking the past to the future. And Indian Lake has quite a storied past. Nearly everyone in this part of Ohio has some historical connection with or fond memory of Indian Lake, whether it’s memories of your dad fishing on the lake, or an aunt or uncle who had a cottage on one of the islands or maybe your mom going to the Sandy Beach Amusement Park on the weekends when she was a teenager. Odds are, even someone in your family’s past may have proposed marriage at the top of the old Sandy Beach Bridge. It is said, hundreds and maybe even thousands of proposals occurred atop the bridge back in the day. Lots of memories have definitely been made at Indian Lake and the dedicated folks at the Indian Lake Area Historical Society have now immortalized, documented and celebrated those memories for the public to enjoy, with these 11 historical markers on permanent display. “Much painstaking time and care was devoted in gathering the information presented on these historical markers,” said Julie Schrader, trustee for the Indian Lake Area Historical Society. “A huge team effort has gone into the design and construction of them,” said Schrader. “We also already have at least six sponsorships for the markers. Some of the markers are still available for sponsor. “Those already sponsored will have acknowledgement plaques affixed to them in the near future,” she added. The markers capture the many by-gone eras of Indian Lake including the Sandy Beach Amusement Park, the Erie Canal/Lewiston Reservoir, Big Band Era, boats of Indian Lake, Interurban train connections to the lake, the Our Lady of Fatima statue, the 1913 flood, the villages of Indian Lake, the beaches and islands of the lake and the newly-restored bridge linking the lake’s storied past to the present day and the future. As Schrader walked from marker to marker she was beaming with pride and even tearing up while she read some of the captions. It becomes readily apparent that a lot of passion has gone into this project. A lot! She loves Indian Lake, has such a great passion for the area, knows virtually everything about Indian Lake past, present and future and cares deeply about everyone and everything here. And that’s the real story here, capturing the passion of Indian Lake. That’s what these historical markers do, they convey the passion and love of the lake so many have and have had in the past. They capture what “going to Indian Lake” and being on “lake time” is all about. Indian Lake is a very special place and is actually quite famous and known to many nationwide. Shrader and the dedicated folks at Indian Lake Area Historical Society and the Sandy Beach Bridge Committee have gone to great strides to create a very special gathering place at the Russells Point Harbor to memorialize and celebrate the storied past, present and future of Indian Lake. They have been great stewards of the precious memories of the past and the precious memories of so many who have passed through this one of a kind place. They have been successful, very successful in their efforts and have accomplish their mission and should be commended. If you haven’t been up to Indian Lake lately, get yourself on “Lake Time” and get up there. Maybe take grandma and grandpa to visit these new historical markers on the “History Walk.” They will love walking over the new Sandy Beach Bridge also. It just might conjure up some old fond memories and you might even make a few new memories while you are there! https://www.weeklycurrents.com/wp-content/uploads/sites/13/2017/06/web1_marker-1.jpgThere are over 60 islands and many beaches on Indian Lake, originally known as Lewiston Reservoir. The reservoir was created by manually excavating and building three miles of earthen dam in several areas and joining seven natural lakes and large ponds. 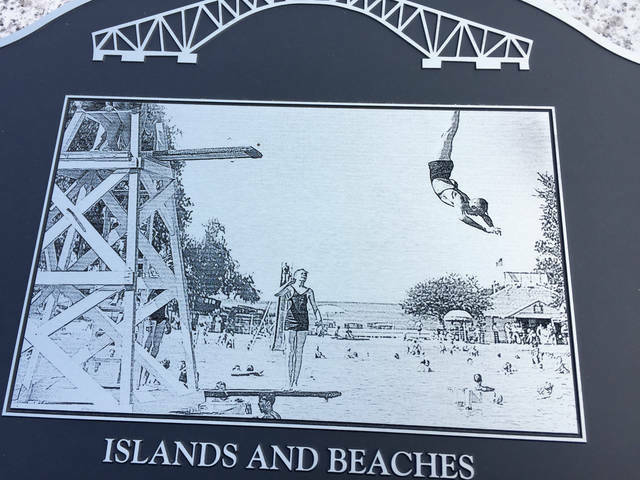 It was a Miami-Erie Canal feeder lake until 1896.
https://www.weeklycurrents.com/wp-content/uploads/sites/13/2017/06/web1_marker-2.jpgThe Sandy Beach Amusement Park was known for bringing in the biggest musical stars of the Big Band Era, such as Rudy Vallee, Guy Lombardo and Lawrence Welk. The park had many dance halls including one of the largest in the Midwest, called the Minnewawa.